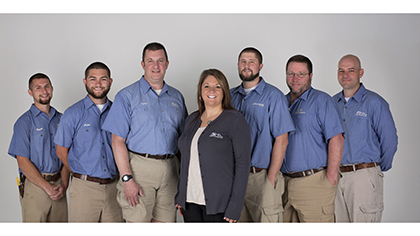 The Business and Security Systems Installation Team consists of seven members, including supervisor Heather Berrier. They enjoy working together to conquer the challenges that come with each installation. The team installs traditional digital phone systems as well as VoIP systems, plus security and camera systems, and networking for small businesses. “We install wired security systems for new structures and wireless systems for extra structures,” said Berrier. The team has been successful with this collaborative approach in overcoming obstacles. Berrier comments, “Our most recent accomplishment was providing VoIP services for a major local corporate account. It was a much larger installation than we typically do.” In addition, they’re currently working on a big project with a nearby municipality. The most commonly requested services are security and surveillance systems. “These services, which include internet protocol (IP) as well as transport video interface (TVI) cameras, allow us to provide peace of mind to our customers,” states Berrier. Video surveillance cameras are available to fit any budget and include features such as viewing via PC or smartphone and a hard drive to store footage. Camera options are available for indoors, outdoors, and vandal-proof locations. “Customers should also know that all of our security and surveillance techniques are registered with the North Carolina Private Protective Services. This agency administers the licensing, education, and training requirements for persons, firms, associations, and corporations engaged in private protective services (including alarm systems) within North Carolina,” says Berrier. Over the next couple of years, the team will look for opportunities to expand the organization’s product line.